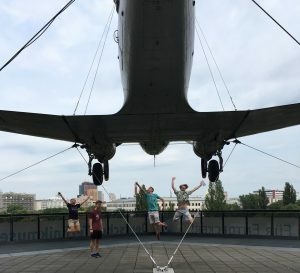 We went to the Deutsches Technikmuseum as a group, and we enjoyed our time there! On the top floor there was a plane suspended from the outside of the building. They had both life-size and scale models of various boats, an exhibit on energy, a flight simulator, and many other cool exhibits. During our trip to the Holocaust museum, I was surprised by the power that personal stories had. The Holocaust museum here in Berlin tells in detail the stories of families and individuals who suffered in the Holocaust. The stories of individuals helped me better empathize with the victims and made that time seem very real and very recent. As I spent those few hours in the stories of those people, I was overwhelmed by the grief and pain they endured. I have never been faced with someone else’s suffering in that personal kind of way.